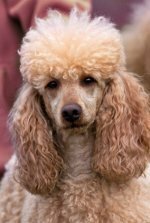 Pet leashes (leads) and collars are essential items in every poodle's wardrobe. Buy a less expensive, basic collar for your puppy while you are training him. He'll grow out of it, so you'll have to get another one for your adult dog. You can skip a collar and get a leather or fabric walking harness which is easier around the throat area (especially for toy poodles). This walking harness is not the harness that is used for car rides, you'll need to purchase one made for taveling. Keep in mind harnesses give you less control when walking your dog than collars do. Leashes should be at least 6 feet long. Get one that is the right size for his weight. There are leather, nylon and cotton leads. Leather is more flexible and lasts longer. Leashes come in lots of colors and you can usually get collars in the same color. Don't buy a plastic or chain lead. You can get a puppy leash for puppies that are shorter and lighter than regular leashes. There will be a ring on the collar to attach this. Let her drag the leash to get used to it, then pick it up and walk with her. 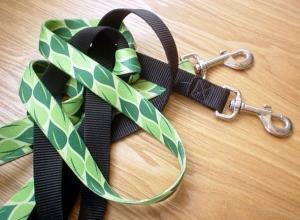 These shorter, lighter leads are good for toy and mini poodles. 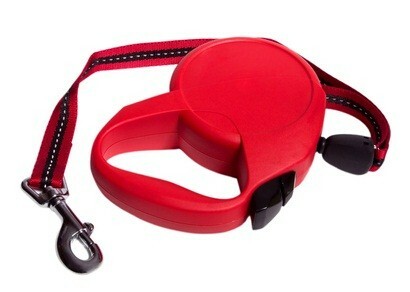 Retractable leads have a handgrip and the lead inside a plastic holder which gives you up to 30 feet of lead. They're not suitable for puppies, leash training puppy or going for short walks around your neighborhood where your poodle could get tangled in trees or bushes. They're suitable mostly for open spaces. Leashes are great for keeping your puppy or adult dog near you when going for walks, for keeping him from running off at an airport or vacation destination, and from running out on a busy road while walking.